Stratford upon Avon Canal, home to the birth and death place of William Shakespeare, is an area steeped in culture and history, all of which you can experience yourself when you hire a narrow boat for a holiday getaway. 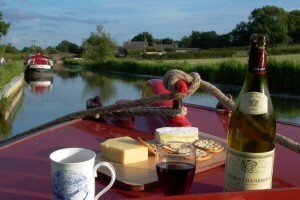 Waterways Holidays offers canal boating holidays from various bases such as ‘Wootton Wawen’, ‘Stratford upon Avon’, ‘Warwick’ and ‘Napton’, all situated in rural Warwickshire. No previous experience needed as tuition is given on arrival, a perfect holiday break for families and couples alike. 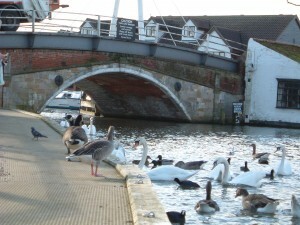 Starting a canal boat holiday at Stratford upon Avon, you are situated near the Bancroft Basin and riverside gardens. From this base you have the option to cruise south onto the Upper Avon Navigation, or north up the Stratford upon Avon Canal. 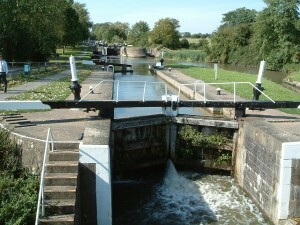 The canal offers more locks, suited for the energetic boater, and connects to the Grand Union Canal within 11 hours of cruising. 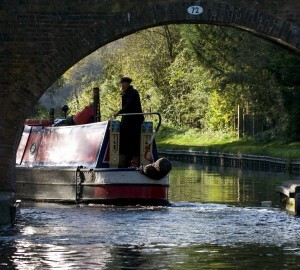 If you are looking for a slightly less active route with less frequent locks, why not try cruising down the River Avon. Suited for a weekend getaway, you can reach the market town, Evesham within 7 hours of departure. This town is renowned for fruit and veg growing, with beautiful fruit blossoms in spring surrounded by medieval buildings. Near the River, is Abbey Park, a local garden, with its Victorian bandstand playing music on Sunday afternoon’s right through from June to September, perfect for those lazy summer afternoons. In a week’s break you can even reach Warwick from cruising onto the Grand Union canal, and experience all the delights of this city centre, such as Warwick Castle and other magnificent historical buildings. Cruising along this canal, you will come to the Hatton flight, consisting of 21 locks, great for entertaining the children and for a heart pumping work out! Travelling by canals through Shakespeare’s country gives holiday goers the flexibility to moor up their hire boat and visit any sites of interest, whilst having the comfort of being able to return to their portable home on the water. You can pick from a large list of available attractions, pubs and restaurants nearby and simply start cruising! This weekend on the 2nd and 3rd of July, Stratford upon Avon will be celebrating the River Avon and Stratford canals, with their annual Stratford upon Avon River Festival. The festivities include yoga and martial arts classes, local bands, food and drink stalls, firework displays and lots of boating river displays including a man in a coracle! More than 2,000 visitors are expected to gather to soak in the celebrations and be entertained by the River displays. The town is said to be transformed full of carnival atmosphere, there’s a children’s zone with face painting, donkey rides and a pirate ship to keep the kids entertained, and plenty of riverside Pimms, local ales, and delicious food treats for the adults to indulge in. What items do you need to take on your boating holiday? It is always useful to purchase a map (we recommend a Nicholsons Guide) before you depart on your boating holiday so that you can work out where the locks are and areas of interest to visit. The sun’s rays are much more powerful when you are on the water, so sunglasses, protective cream and a sun hat are recommended. All your cooking utensils, crockery and cutlery will be supplied onboard, sometimes the yard will also supply some waterproofs for the helmsman. Although we always hope you won’t have to use them! If you haven’t been on a boating holiday before and would like a list of suggestions for things that may be useful on the boat, we can supply a list on your confirmation e-mail. Do you have to pay for mooring? Most of mooring along the canals are free. Occasionally leading up to and in city centres you may be charged for overnight mooring. In Bristol dock there is an overnight fee of £35 every 24 hours for example, and areas of the River Thames may also charge to moor up. You can only moor up when it’s not private mooring spaces allocated for people who own boats. You are not able to moor up anywhere were you are obstructing a lock or bridge. There are often mooring posts or rings along allocated areas where you can tie the rope around, or you can use the pins provided on-board. Full tuition will be supplied on arrival. What is the difference between a fixed bed and a dinette double bed? A fixed bed refers to a bed that can remain set up for your whole holiday. 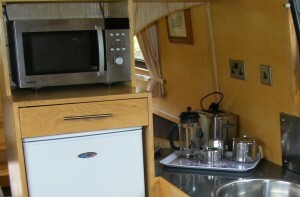 If however you are looking at a layout that shows a dinette double bed, it will have to be made up in the evenings. During the day a dinette double comprises of a sofa bench area, often in an ‘L’ shape, with a temporary table, which is the dining area on-board. To assemble the bed in the evening you either drop down or pull out the table area and put a cushion on top. The number of fixed beds can sometimes help to determine the price of the boat. What is the difference between 12 volts and 240 volts power supply on the boats? All of the boats have 12V power unless otherwise stated. The 12V boats however, can power already built in appliances like colour TV’s, DVD players, CD players & radios, fridges and lighting, most of which is supplied on the boats as standard. 12V boats have a cigar lighter socket on board which means that all you are able to charge is your mobile phone in the same way as you would in a car. Some boats have a 240V power supply however. This means that they may have 3 pin sockets on board. Please note that there is always a wattage restriction on the 240V boats, the restriction is dependent on the boat itself and means that you may not be able to use appliances that you can normally use at home. Please do check when booking if you would like to take any electrical items on board that may need to be plugged in. Are you looking into booking a holiday or weekend getaway? Boating on the Norfolk Broads allows you to take the feeling of home with you on holiday, including your pets! There are plenty of pet friendly boats available for hire throughout the year, all over the Norfolk Broads and UK canals. It’s ideal for people trying to avoid expensive kennel fees. For first timers looking into taking a pet on board a motor cruiser, I would suggest the forward steering cruisers for canine comfort. This style of boat is generally one level in the interior and you can also let you pet sit on the front well. It goes without saying that buoyancy aids will be supplied for all the crew, the yards at Potter Heigham and Wroxham also supply large/medium and small dog life jackets for a minimal refundable deposit. 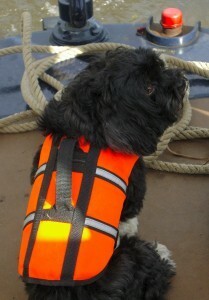 Life jackets are kitted out with a handle on the back so you can easily pluck your pet from the waters. There are lots of picturesque walks and trails, accessible via the waterways. 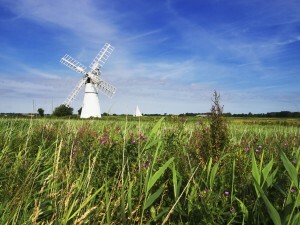 Packed full of wildlife, the Broads are Britain’s largest nationally protected wetland. The trails provide a perfect opportunity for stretching your pet’s legs (and yours too!) Why not try the ‘Coltishall to Horstead walk’, which crosses the River Bure and takes you past historical sites such as Saint John’s Baptist Church, dating back to 1284. The open fishing season starts on the 16th June and runs until 14 March 2012. All you need to fish in the Broads is a current Environment Agency rod licence, available from post offices. Once moored, fishing off the boats is very popular; the rivers are packed full perch, bream, pike, rudd and tench, guaranteeing even the most inexperienced fisher a bite! I’d suggest visiting the retail store: ‘Latham’s’ at Potter Heigham, if you’re considering fishing. It’s one of the largest fishing tackle retailers in the UK and supplies everything you may need, from bait to rods, all at discounted prices. To top it off, for your evening meal you can moor up at one of the pet friendly pubs along the riverside or walk into the towns for even more choice. A few examples of pet friendly pubs are: The Red Lion in Coltishall, Bridge Inn in Acle and Bernley Marshes in Great Yarmouth. Don’t forget the pet friendly boats on the UK Canals too! A couple of spare towels, in case your dog decides to take a dip! The dog will generally prefer to be near you when the engine is running for a bit of reassurance so be aware of your pet at your feet. 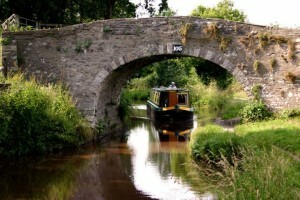 Wales is home to two navigable rural canals, the Monmouthshire & Brecon Canal and the Llangollen Canal. These canals are always a popular choice for people looking to holiday in the UK and both offer unique and awe-inspiring experiences. Dating back over two hundred years, this canal meanders through picturesque Welsh countryside from Pontypool to Brecon town centre, covering 36 miles and 6 locks. The waterway cruises through the Brecon Beacons National Park so there is plenty of wildlife to spot such as kites, herons and kingfishers. Although the Mon & Brec canal is arguably one of the most unspoilt canals in Britain there are also plenty of canal-side pubs to stop at for your evening meal! 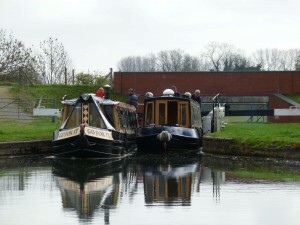 The canal offers a very tranquil and laid back boating holiday, ideal for beginners and experienced boaters alike. It’s a great canal to escape from the hustle and bustle of modern life, running along the River Usk and cruising through the peaceful woodland. The canal was originally an industrial motorway, transporting raw materials from nearby quarries by boat to Newport. Relics of the industrial revolution are still visible in many places, with old coal mines, lime kilns and abandoned tram line remains dotted along the waterways. There is also a more decorative historical artefact to visit at Cefn Brynich, a beautiful aqueduct dating from 1812. Well worth a mention is the boat yard at Gilwern, north of Goytre Wharf. They have started a canal boat revolution by introducing electric boats to their fleet. These super quiet electric motors can cover 18 miles in a single charge. Recharging is simple – there are lots of recharging points along the Canal, at which you can hook your boat up & simply switch the power on. There are also many treasures to experience on the Llangollen Canal, which crosses the border from Shropshire in England into Wales before finally terminating at Llangollen. 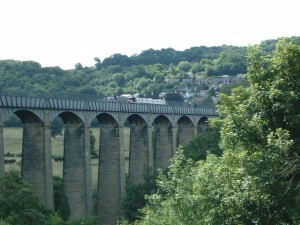 The Pontcysyllte Aqueduct, the ‘Stream in the sky,’ passes over the River Dee valley, and is simply a must see if you are cruising this Welsh Canal. The aqueduct is a Grade I Listed structure and World Heritage site. It spans 1,000ft and is 125ft high, giving you the feeling that you’re travelling on a magic carpet ride. You can also moor up and visit the Llangollen town centre, a little market town surrounded by the River Dee. The railway at Llangollen is a volunteer-run preserved railway, which even supplies taster sessions where you can learn to drive a traditional locomotive! The town is steeped in history and also has a castle ruin that has been abandoned since 1282, named ‘Dinas Bran’. Well worth the climb to check out the view of the attractive town. You can easily cruise the entire length of either the Llangollen or Monmouthshire and Brecon Canal’s in a week break, a jam packed holiday perfect for all. Call 01252 796400 or click here to search live availability. The Waterways Holidays team have just returned from their holiday afloat on the Kennet & Avon canal. We enjoyed our time so much we thought it would be nice to let you know how we got on! Everyone receives tuition, even the staff at Waterways Holidays! So after receiving a detailed show through of the boat, handling tuition and lock instruction from Richard at Aldermaston Wharf, we set off on our weekend hire of 63ft narrowboat, ‘Crofton’. Narrowboat hire is fairly straight-forward, we spoke to many narrowboat owners, during our mini-adventure and the best advice we were given is to take everything slow; not to rush and to go at your own pace. We took some time out to take a few pictures along the way – hope you like them! Each lock presented a slightly different challenge along the Kennet & Avon canal, being a little bit different to the others- brilliant for keeping kids entertained! One lock that was particularly memorable was the Monkey Marsh lock, one of only two surviving turf-sided lock’s built in the 1700’s. Cruising on a boat is a very social way to travel. The crew all works as a team, whether you’re jumping off to set the next lock, opening a swing bridge or steering the boat. Families walking past on the tow path really enjoy the sight of a narrowboat on the waters, everyone is really friendly! A holiday on the canals is unique way to explore surroundings, whether somewhere completely new or a chance to rediscover your local countryside. There is so much wildlife to spot from the boat; we were able to see deer, rabbits, herons and lots of birds of prey such as red kites, it really feels like your cruising along with nature. 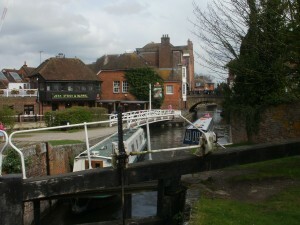 As well as navigating through the countryside, by Saturday afternoon we were in Newbury town centre. You cruise right through the town and come to a lock next to the beautiful St Nicholas church, which has been the spiritual centre of Newbury for over 900 years. Here you can stop off and get any supplies you may need, have a bite to eat and mosey around the shops if you fancy! There is also a market running on Saturdays, selling a variety cheeses. On our last night of our Waterways voyage we decided to venture into Thatcham for a meal out at a pub, just a stone’s throw away from the canal. The Swan, a converted stable house, had a bustling atmosphere, friendly staff and a ‘pub grub’ menu. There were a selection of local brews available and the pub itself was decorated with vintage posters. On our arrival back to the marina, we discovered a quaint country house that had been converted into a Café and Souvenir shop. The Aldermaston Visitor Centre, located on the canal next to the marina itself, served a selection of café treats and lots of little souvenirs with some information about the canal’s history upstairs. Seated outside on the benches, relaxing in the sun next the water- A perfect way to end our holiday along the Kennet & Avon canal. Aldermaston Wharf is located close to Reading on the picturesque Kennet and Avon Canal, which runs from Reading city centre to Bristol. If you would like to have a look at our holidays along the Kennet & Avon, or any stretch of the UK Canals, why not have a look at our website or give us a call at 01252 339026. For our latest spring offers just click here. Known as ‘Britain’s Magical Waterland’, spring on the Broads brings the promise of brighter evenings, atmospheric misty mornings and tranquil waters. There’s 125 miles of lock free cruising, which can be enjoyed from the comfort of a modern, well equipped motor cruiser, or a traditional Broads sailing yacht. Become the skipper of your own boat and cruise at your own pace. Explore the unspoilt villages along the river front or moor your boat for the afternoon to travel on foot along the many designated nature trails. 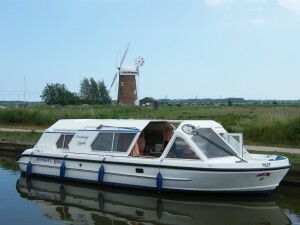 What sort of things can you experience by boat on the Broads? There is so much for everyone on the Broads. As Britain’s largest nationally protected wetland, there is an abundance of wildlife around every corner. From cute ducklings to graceful Whooper Swans, a boating holiday is perfect for children and adults alike – so remember to take your camera! For a great family day out, the Bure Valley Railway comes highly recommended. Moor your boat at Wroxham, the birthplace of boat hire on the Broads, and it’s just a 10 minute walk to board your train. 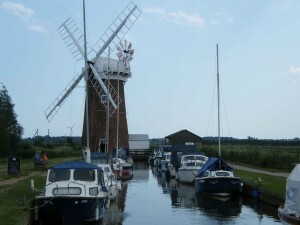 Horsey Wind Pump near Hickling is a must see if you’re in the area. Climbing to the top offers breathtaking views over Horsey Mere. After mooring in Horsey Mere Staithe, take the 15 minute walk across the fields and sand dunes to discover miles of picturesque sandy beach, perfect for stretching the dog’s legs. In the evening you may even be lucky enough to spot seals relaxing on the shore front. What sorts of people enjoy boating holidays? Boating holidays are open to everyone with all levels of experience, including complete novices. No previous experience is required as full training is given on arrival when collecting your boat. The team at Waterways Holidays are all keen boaters and are more than happy to help with any queries to ensure your choice of boat is the right one to get the most from your holiday. Boating is perfect for a safe and fun filled family holiday, with plenty to keep the children entertained. There are also plenty of opportunities for couples to share romantic moments under the vast blue Norfolk skies. Many boats are pet friendly so you can ensure that the whole family can holiday together! Don’t forget our traditional narrowboats, sailing yachts and motor cruisers for boating getaways! Converted narrowboat: ‘Hawkesbury,’ cruising the Trent & Mersey Canal from 1937, is the last ‘Big Woolwich’ and former cargo carrying vessel. Available for skippered hire; you even get a “boat dog”! This leaves you free to soak in the rural sites along the bank, taking the controls if and when you like. Tug styled narrowboats: ‘Larch,’ from Middlewich and ‘Anjou’ from Whilton, traditional styled cargo carrying boats. These boats have a large flat decking section at the front- with a stowage area underneath. The long flat front provides a perfect spot for all parties to enjoy, taking in the summer sun and picnicking off the boat. Motor Cruisers: ‘Merlin’ from Chedgrave and ‘Juliette’ from Martham: Traditional all wooded boats, particularly handy for those wanting to catch the rays whenever possible as they include sunshine hatches over saloon and galley, collapsible side sections and a centre cockpit with all-weather protection. Sailing Broads yachts: Available for Norfolk Broads boat hire is ‘Zoë’ from Horning, built in 1897. The only Victorian counter stern yacht on the Broads and exhilarating to sail. She sleeps two people, so ideal for a couple with a little yachting experience.